A football match in memory of former Brighton and Southwick forward John Shepherd will take place next month. John died aged 86 in June after a lengthy career in local football. He began his career with Millwall and also played for Brighton, Gillingham and Wickers before two spells as Southwick manager. John spent almost 30 years at Albion as a player, coach and scout and also founded the club’s first-ever youth team with Mick Fogden and Alan Mullery. The match between a former Albion XI and ex-Southwick XI will take place on September 16. Fogden will manage the Brighton side, which will include Dean Wilkins, Stuart Tuck, Dean Hammond, Adam Hinshelwood, Steve Foster, John Keeley, Kerry Mayo and Ian Chapman. Tony Gratwicke is in charge of the Southwick side and Mark Burt, Lee Cox, Gareth Green and Danny Smith are among the players who will turn out for Wickers. 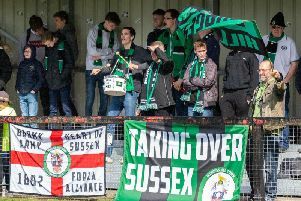 Before the game kicks off at 1pm, Sussex FA chairman Mathew Major and FA council member Tony Kybett will open the John Shepherd Stand at Old Barn Way. Anyone who knew John is invited to attend.